Dominos offers you 10% cashback on orders via Freecharge. Maximum cashback Rs.50/- on minimum transaction of Rs.250/-. This offer valid once per users only. To avail this offer, you needs to undertake a successful transaction on Freecharge. Minimum transaction value should be required to get the freecharge cashback. Offer valid for new as well as existing users. Dominos Weekdays Special Offer! Order pizza from dominos & get Flat 20% discount on your order. 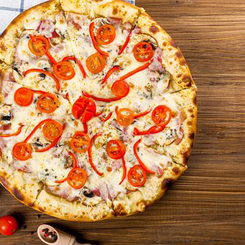 Explore the delicious range of pizza with extra cheese topping, fresh veggies & more from your preferences. Simply enter dominos coupon code during checkout. In order to avail this dominos offer, minimum transaction should Rs.300/-. Dominos offers you to buy any 2 pizzas worth Rs.139/- each. Don't compromise with your taste if dominos offers you a regular pizza with a whopping discount. Enjoy this offer without using any dominos coupon code. Don't lose this exciting dominos offer! Hurry up. Latest dominos offer on Amazon pay! Now order your dominos pizza online & get Rs.100 cashback via using Amazon Pay. You can order any pan & regular pizzas according to your taste with extra cheese & topping of veggies. Make sure that payment confirms by Amazon pay during checkout. You do not need to apply any pizza coupon code to get this dominos offer. Are you searching for the best offers & discounts on Pizza? Your search ends right now! We at Woocoupons give you the latest, manually verified Pizza offers & coupons from the best online stores. Explore our hand curated coupon codes & offers to save money every time you shop for Pizza online. We list only the best Pizza coupons, deals, offers & insider promotional sales that will give you the best bang for your buck. Our vast selection of exclusive & 100% working vouchers & offers on Pizza from popular online stores like Foodpanda, Faasos, Swiggy, Pizza Hut & many more - are crafted to delight you. So gear up to save big :) Subscribe to this category and never miss an alert on the latest happenings. Don't forget to thank us later!